We are a true Martial Arts School, not a daycare, and as such we are not in the supervision and care business but rather, the talent and skill business. We pick up from most Elementary and 2 Middle Schools and work with kids 5 - 12. We own our own Transportation Company (TASMA, LLC) and only use our own dedicated professional drivers that have DOT and CDL licenses with background checks. Our Martial Arts staff is in the school with the children where they belong, not out picking up students. This program has been perfected by Kyoshi Jim King since 1991. 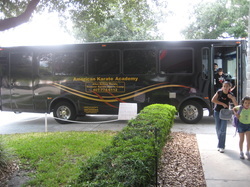 We typically provide transportation from 20 schools in the area to our facility on Sunshine Lane in Altamonte Springs. This is a week-to-week program provided as a constructive alternatvie to daycare, extended day at school and babysitting or latch-key. We have no contracts. There is no extra charge for in-service days when the children are out of school all day. You may drop off as early as 7:30am and pick up as late as 6:15pm. Pack a lunch on those days and we will have two classes with one in the morning at 10am and 4pm. If you have prepaid for a week and your child becomes ill and only attends one or two days, we will credit the unused portion of that week to the next week. If you do not attend a week, you will not be charged. We are in the talent and skill business not the supervision and care business. The only reason to use our program is to learn the Martial Arts and its tenants that we teach: Exercise, Discipline, Respect, Manners, Self Defense and Self Esteem through earning Belt Ranks found nowhere else. This stuff really does carry over into their school work and home. We give out special awards for children who get on the honor roll at school who have no check marks for bad behavior. We give out yet another award for straight "A"s and take their picture and honor them on our Honor Roll Wall. We give out still another award for performing at least 7 chores each day at home for 30 days of which the parent will be given a chart to follow and fill out. All these awards will always be given in front of the whole student body with applause. We are not a commercial school and we will not put a rank belt on anyone who hasn't earned it. We will not put a Shodan (Full Black Belt) on anyone under 16 years of age. We have some children who have worked real hard over 4 or 5 years earn a Junior Black Belt. They will stay at this rank until they are at least 16 and proficient in all their Karate. We have a certified trained staff of 8 instructors on the main Dojo floor at one time teaching 8 different levels of class simultaneously in four main rooms. Each room is over 1,100 sq. ft. divided by PVC vertical curtains with a special rubber floor for safety. We have physical games in each room before class. 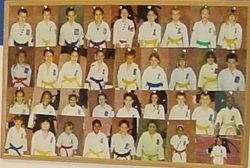 We are a Licensed Martial Arts School and not a daycare or a tutor. Children may eat a snack before class. Class time is from 4pm until 5pm each day. You may pick up your child from 5pm until 6:15pm on the way home from work. They will need to come prepared each day to learn and must bring their uniform for class. We are an open access facility.